Washington D.C. Trip a Success! “Unbelievable.” This is the word Mayor Sandy Stimpson used to describe his experience in Washington D.C. supporting of the I-10 bridge while talking with a Lagniappe reporter last week. On Monday, September 15, 2014, sixteen elected officials from Mobile and Baldwin Counties traveled to Washington, D.C. to rally support behind efforts to build the I-10 bridge over the Mobile River. The trip, the first time such a group has traveled together in support of the bridge project, was coordinated by Coastal Alabama Partnership and included mayors from Mobile, Bayou La Batre, Dauphin Island, Prichard, Satsuma, Saraland, Bay Minette, Spanish Fort, Daphne, Foley, Fairhope and Gulf Shores and county commissioners from Mobile and Baldwin counties. 3) Building a regional coalition in support of the project. Over two days, the members of the delegation met with the Federal Highway Transportation Administration, Alabama Senators Richard Shelby and Jeff Sessions, Alabama Congressman Bradley Byrne, Florida Congressmen Ted Yoho and Steve Southerland, and Louisiana Congressman Steve Scalise (Majority Whip). 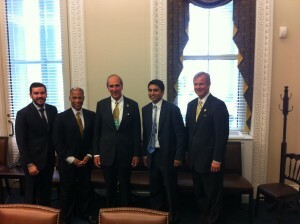 Additionally, the delegation met with members of the White House staff. Meeting with Congressman Scalise in D.C. 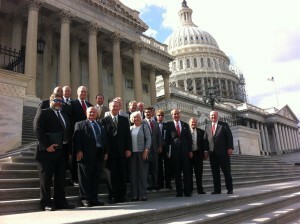 The lobbying efforts of Coastal Alabama’s delegation had a large impact in Washington and secured the support from state and regional officials. 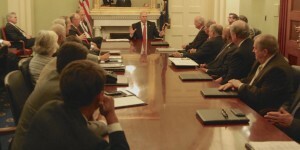 During their meeting with Congressman Byrne, he stressed that though there are similar transportation issues to the I-10 corridor throughout Alabama, the I-10 bridge is an acute issue, as it is a pinch point for moving goods and people across the southeast. 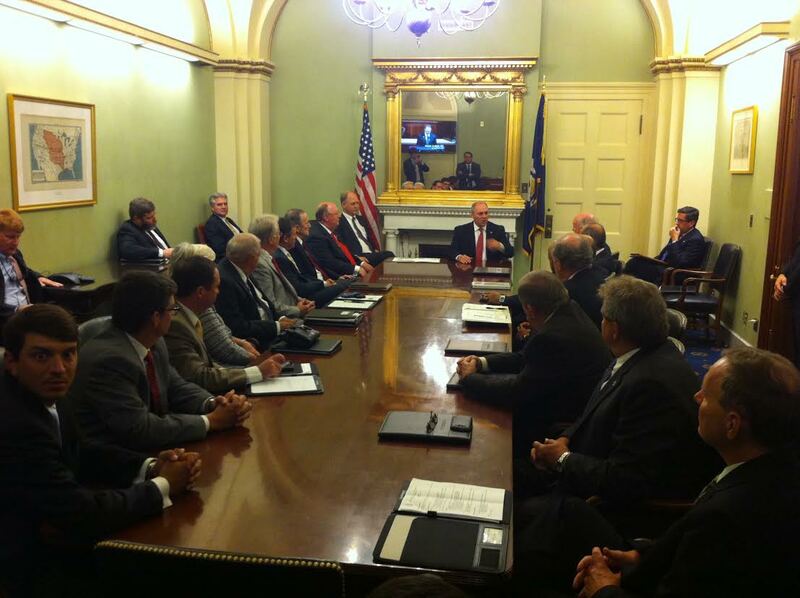 Congressman Southerland and Congressman Scalise both offered to work with Congressman Byrne in support of the I-10 bridge as a regional issue. The congressmen sympathized with our delegation on the issue as they too have experienced the terrible congestion while traveling through Alabama’s coastal counties. At the end of their trip, Congressman Bradley Byrne met with U.S. Transportation Secretary Anthony Foxx and Mr. Foxx has agreed to visit Mobile to see our area’s transportation issues firsthand. This will be the first time someone from the Obama Administration has come to Mobile, Alabama to discuss the bridge project since 2012. 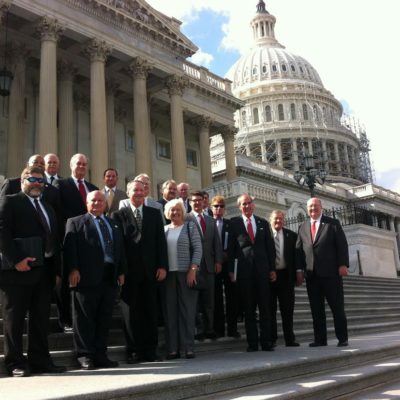 Coastal Alabama Partnership would like to thank our elected officials and business leaders who traveled to Washington to make our voices heard! We look forward to continuing to work with our local leadership on this issue and others that are important to our area.